Los Angeles—As I gathered titles, other needed documents and money to participle in the government’s new free money program it was shut down. On its face the program seemed to be beyond fiscally irresponsible. I saw this as a way to regain a tiny percentage so much of my money that went into the tax collector’s toilet of government waste. The government made a contract with Americans and with lightening speed breached it. 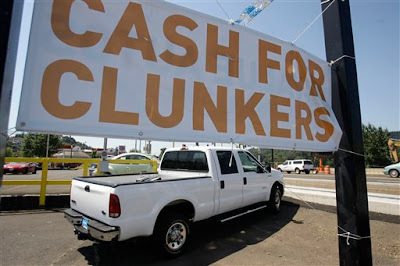 Now we can expect a flood of litigation from disenfranchised clunker owners. What about the car dealers that spent huge amounts of money on their marketing programs to move those cars that previously were not selling because of the stalled economy? The insanity here is that the potential for litigation and payouts will cost the taxpayers a lot more money than the ill conceived giveaway program. By the way you can count me in as a plaintiff. They can't administer an automobile sales plan, but we're supposed to trust them to administer health care? I can hear them now....."well, we have to suspend all medical procedures because we've temporarily run out of money..."
Don't forget they couldn't even run a whore house that sold alcohol......and that was when the economy was good! Ironic when you have to consider they are a whore house! You are being to hardon Mr. Obama. Lighten up. Pathetic display of government incompetance. About what we all expected. Wait till they get to the hard stuff like health care. Look out for the White Sheet Salesmen!